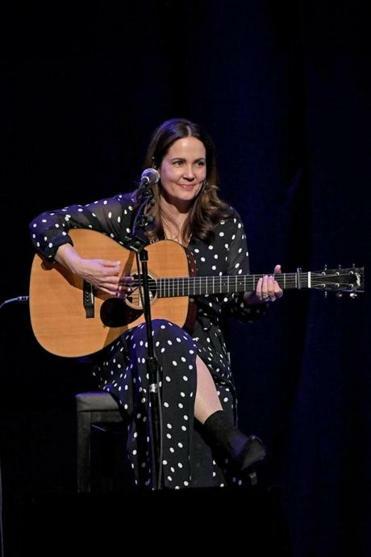 Lori McKenna, the Grammy-winning writer of hits for the likes of Little Big Town and Tim McGraw, is about to release “The Tree,” her 11th album. She’ll play a sold-out hometown show (or near-to-home for the Stoughton townie) at City Winery Wednesday evening, as part of her “The Way Back Home” tour in support of the new album. McKenna’s pop-flecked country-folk is characterized by recurring themes of family and relationships, parents and kids, husbands and wives, that issue from what she labels a “domestic” perspective. Whether offering ruminations on the inescapable — kids growing up, parents aging — or spinning the ways of mothers and of fathers into song, “The Tree” continues that pattern. And it finds the singer-songwriter continuing to do what she loves to do, telling stories: “I love how we all have these remarkable things that happen to us, every single person, and I love picking apart those stories and looking at them in a 3½-minute song.” We talked with McKenna about her new record and the making of it in a recent phone conversation. Q. What do you see as the theme or connecting thread on the new record? A. The song “People Get Old” was definitely the anchor of this record for me. Then I thought, it’s just a terrible title, I can’t name a record “People Get Old.” And then we wrote “The Tree,” and that song really to me said so much about family. I’ve always been obsessed with trees, weirdly, since I was little. So that was the perfect title in my brain and then, “People Get Old” being inspired by my dad, it just seemed fitting to have this be a record about aging and watching your kids go off and watching your parents age. If you had your kids young enough like I did, you have a point in life where your kids are leaving the house at the same time that your parents start showing signs of needing more help. Q. That song, the title track, plays off of the old notion of the family tree in interesting ways. A. I wrote the song with Natalie Hemby and Aaron Raitiere, and it was just a really joyful co-write. We wanted it to be about how your family is there for you; even during the times of your life where you are not authentically yourself, you haven’t figured yourself out, that family structure in some silent way is still there for you while you’re figuring it all out. And whether you stay, or you go somewhere else and stay away, or you come back, it’s there for you. Q. One of the songs on the record, “You Won’t Even Know I’m Gone,” talks about your professional life, and the tensions that can arise between that and home and family life. A. I was going away for a 36-hour trip. The kids had school the next day and I’m telling them to go to bed, and I said to my youngest, I’ll be back before you get out of school the next day, you won’t even know I’m gone. And I realized that I am one of those people who tries to make sure everything’s perfect in the house, they know where everything is, the laundry’s done. I think that’s what a lot of parents do who travel for a living. It’s like if everything in the kitchen is perfect, everything will be fine. There’s still that guilt about being away, but also, I have to do this for myself. And when you grow up, I want you to do something that feeds you as much as music does for me, but right now, I know it’s kind of taking away from your experience. Q. You started making this record in trying circumstances. A. The day we started in the studio was the day after the shooting at the country festival in Las Vegas. I flew in Monday morning the day after that happened and there were still friends checking on friends. Nashville was real dark that whole week. And for a moment we wondered, should we even do this today, or should we reschedule? And then Tom Petty died that day. It was just a day. We cut “The Fixer” first, because Dave Cobb, the producer, said, “You’re going to give us a sad song. What’s the saddest song you have?” We did “Happy People” next. I don’t know if it’s even fair to mention all that when someone listens to the record, because I still think the heart of the record is respecting the love of your family and the love of your friends and people we go through life with. But on “Happy People,” Dave played a 12-string Rickenbacker on that song. I think in Dave’s mind that was a little bit of showing his love and respect for Tom Petty. Q. This is the second record that you’ve made with Cobb. A. With the first record I made with Dave, “The Bird and the Rifle,” I learned that going in and playing the songs live, with barely any overdubbing, is the best process for me because I kind of hate being in the studio, and he makes it so effortless, he makes it like you’re sitting around playing songs. I think Dave, knowing me a little bit better after making the last record, was being true to the way my songwriting brain works and keeping it all pretty simple, but some of the parts he added I pretty much love. Q. So how does this record differ from the first one you made together, or does it? A. I think this record is similar in a lot of ways, sonically and band-wise. It’s not as lush, but it sounds a lot like it. I’m not a really diverse writer, so I feel like the songs all run into one another even though the stories change and my goal is to try to get the songs tighter lyrically. I think it’s very similar to the last record. You know, this isn’t a dance record. I haven’t made my dance record yet [laughs]. Interview was edited and condensed. Stuart Munro can be reached at sj.munro@verizon.net.